Dimensions: 96"L x 62"W x 30"Ht. Frame available in 1 5/8" and 2 3/8" O.D. pipe with 1 5/16" O.D. brace. Available in 2" x 10" Untreated pine, treated pine, and redwood stained pine planks. Lumber for outdoor wood furniture naturally resists decay. With our 8ft. 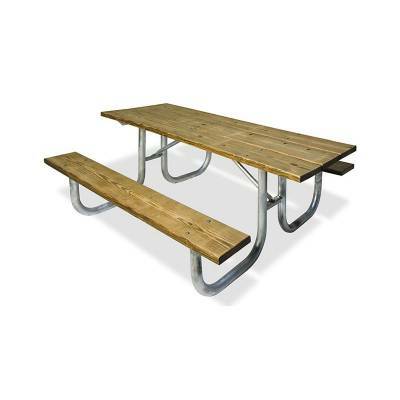 Heavy Duty Commercial Wooden Picnic Table-Portable, you can be assured it's construction is strong, durable and holds up to the elements. Available in 2"x10" Aluminum Planks, Pine or Redwood Stained Pine. Won't rust and is low maintenance, which makes it perfect for all commercial applications. Great for campgrounds, parks or sports complexes. And best of all... Made in the USA! Call or email National Outdoor Furniture today for a quick quote!